We worked with 6 and 7 year old children at Charford First School, Bromsgrove to make this storytelling space as part of their exciting natural play area. The weather was kind to us and we managed to avoid rain. all the children managed to plant a live willow rod. on our second day at the school we created a large woven sun and a willow deer. We carried out a living willow project with The Wildflower Centre, Liverpool in the spring this year. The project was to create a sheltered space using living willow where local families could take their small children to play. We worked with local volunteers over 2 days to design and plant the structures. 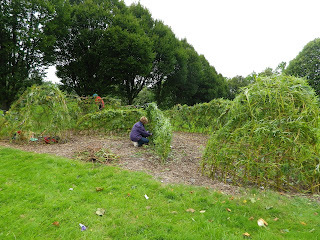 The willow has grown really well and the volunteers are doing a great job of maintaining their new park feature. I cut the first living willow rods of the new season today, there was snow on the distant lakeland hills but it was a nice warm afternoon in the sun with frost lingering in the shaded places. Our first school project will be in 8 days time when we work with a school to build a willow area in their grounds. We still have some days available if you would like a living willow project for you school or community group.